Though there is the sporadic nut in the crowd with nothing but negative things to say, the public’s onion about Alfonso Cuaro&oacture;’s space thriller Gravity has been overwhelmingly positive and complimentary. (Like our own Brent’s glowing review.) All one needs to see is the multitude of blurbs the ad campaign has been using to shove all that positivity down people’s throats. But none of us print and online journalists have been to space, so what do we know, right? 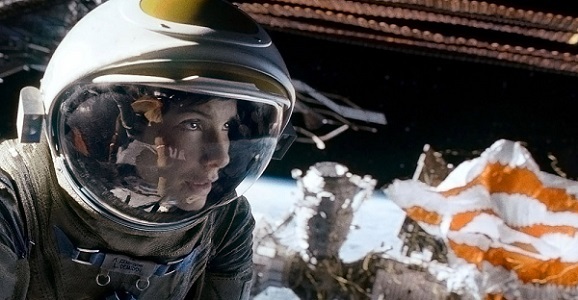 You know who has been to space and is increasingly becoming the go-to guest film reviewer in situations like this? Apollo astronaut Buzz Aldrin, that’s who. And his take on the film, as printed in The Hollywood Reporter, is just as commendatory as everything else. What more could one need to be inspired to watch this movie? “It was a real blast pretending that people were stranded in me. I looked awesome.” – Outer Space. That’s not a real quote, but this one is. ‘I was so extravagantly impressed by the portrayal of the reality of zero gravity,’ said Aldrin. ‘Going through the space station was done just the way that I’ve seen people do it in reality. The spinning is going to happen — maybe not quite that vigorous — but certainly we’ve been fortunate that people haven’t been in those situations yet. I think it reminds us that there really are hazards in the space business, especially in activities outside the spacecraft. 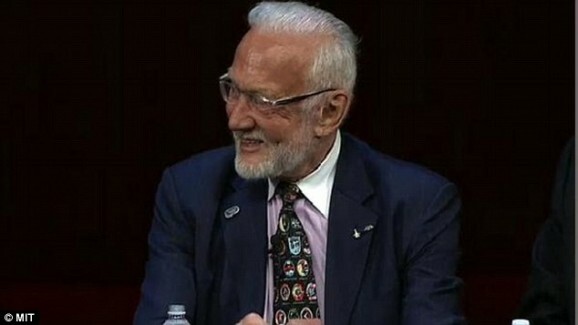 Over 40 years after astronaut Buzz Aldrin first become a household name with that whole “going to the moon for the first time in human history” jazz, the 83-year-old is set to step right back into the spotlight. Or at least behind the scenes of the spotlight. I believe that it will be better than Star Trek or Star Wars because it is more realistic, it deals with real kind of beings a long time ago that had realistic travel capabilities and they weren’t shooting people up or anything. It is genuine progression of exploration to the point where we are now, in our thinking. And [in the story] we think about getting that new information that the fictitious aliens left that we found and gave us the knowledge to travel from our sun to nearby stars… I think what we are doing will progressively be a lot more realistic. Aldrin got a chance to see the film at its New York premiere and spoke with the Huffington Post at an event where he was a guest of honor. Though he enjoyed the set design and the family dynamic between Will Smith and Jaden, he felt the film was too much of a “shoot-em-up,” joking that he would hope “the aliens are more peaceful than they are in this film, wherever they are.” But his main point of contention is one of the oldest errors in sci-fi: sounds in space. “There was a lot of noise,” he said of After Earth. “In space, you don’t get that much noise…Noise doesn’t propagate in a vacuum. We talked over headsets. Fortunately, we were free of static. We could communicate with each other pretty clearly, and mission control, though we were 50,000 miles away.” Should we just chalk another checkmark next to Joss Whedon’s name for offering complete silence in space on Firefly? I think we shall. Maybe if they’d have kept to the film’s original pitch, this wouldn’t have been an issue and we wouldn’t have spent so much time talking about a damned Shyamalan movie. I’m not much of a travel person. Perhaps it’s an evolutionary trait passed down from generations of non-affluent living in my family, but even when money isn’t an issue, my vacations tend to gravitate more towards hubs of activity, rather than the quiet, therapeutic vastness of nature’s more beautiful natural settings. But offer me a chance to go into space, and that third level of House of the Dead 4 at Dave and Buster’s is just going to have to wait. Unilever’s Axe, the body spray brand behind millions of teenage boys’ adamant virginities, is cooperating with Space Expedition Corporation (SXC) and XCOR for a contest that will give 22 winners the chance to take a ride on private spacecraft up into the Earth’s sub-orbit, about 64 miles above the surface, with only the pilot and a 12-foot wide cockpit window for company and entertainment. I bet he starts the meter while you’re still putting your luggage up. Yes, this Axe Body Spray. 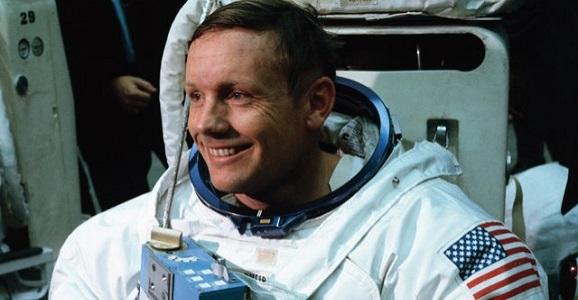 It’s been just over two years since Neil Armstrong left this planet for the afterlife, and eleven years since discussions first began for the legendary astronaut to get his own biopic. Thankfully, there has been some positive movement, as production company Temple Hill is in talks with festival-friendly director Damien Chazelle (Whiplash) to helm First Man. First Man is based on James Hansen’s 2005 biography First Man: A Life of Neil A. Armstrong, and will presumably cover Armstrong’s military career going into his work at NASA, where he did that whole “first man to walk on the moon” business. Armstrong was an accomplished Navy bomber, taking over 70 missions during the Korean War, all before he was 23 years old. He went on to do test piloting for the Air Force for a while before being brought in to NASA for the Gemini and Apollo programs. And it was on the Apollo 11 mission, with fellow astronauts Buzz Aldrin and Michael Collins, that Armstrong first set foot on the moon, uttering those now-unforgettable words.